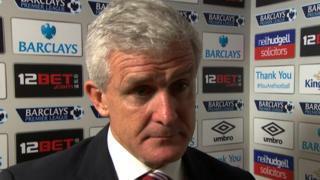 Stoke manager Mark Hughes says he is frustrated because his side did not "show enough intelligence" during their 1-1 draw with ten-man Hull. The Tigers' James Chester was sent off after 14 minutes but it was the hosts who the lead through Nikica Jelavic just before half-time. Stoke's Ryan Shawcross scored a late goal to earn a point for the Potters. Stoke hit 19 shots but only three of them were on target. 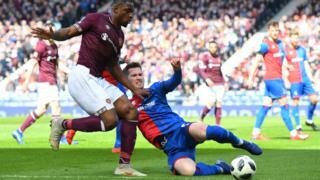 Watch: Scottish Cup semi-final - Hearts 0-0 Inverness CT - will there be opener before break?